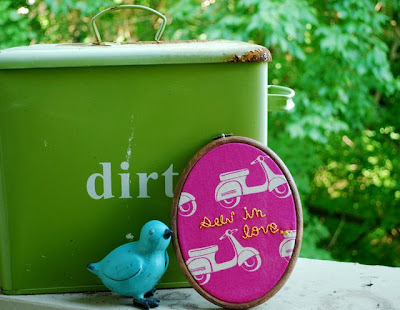 a shine machine: Sew what! Today was the first day of Jamie and I's "Running with Inspiration" challenge!! Obviously, it is a play on words. I am sooo in love with everything that has to do with sewing right now. 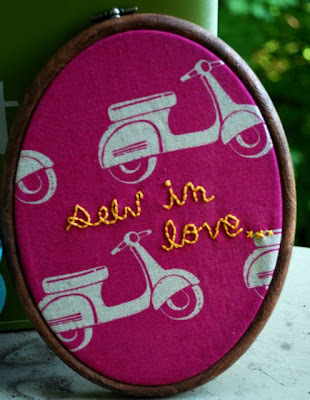 I love embroidery, sewing, quilting, fabric, pin cushions, all of it!! I am also sooo in love with vespas! They are so cute and I totally wish that I had one. Actually if I had one, I would give it to my sister because she wants one big time!! I can NOT wait to see what Jamie comes up with!!! So, that is my very first challenge piece! I would love to hear what you think about this piece!! How cuuuute! That fabric is soooo great!!! Loooove it!!!! Eeeeeek!!!! the fabric with that thread color and then the dark frame---love it love it love it. ooooh! 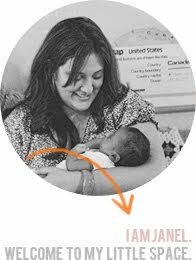 I have been catching up on my blog reading and love your idea with Jamie. Can't wait to pop in all this week and see what you have been doing. ps - 3.6 pounds! You go girl! 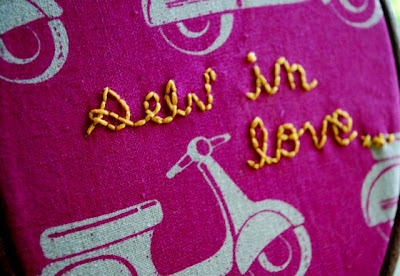 I love it is is so cute, how are you able to sew writing? Every time I try it's a mess.